Nagisa, the main character, is one of Japan's most popular "idol singers", which is something like the idea of a major recording star in North America (think the Spice Girls or Madonna--who is actually referred to in this series, although not by Nagisa). In a desperate attempt to live a normal life, Nagisa chops off her long, pink hair (much to her manager's distress) and dresses up as a guy in order to enter a "normal" school. However, this school turns out not be very "normal" after all, (which her manager figures is why he, a 26-year-old man got in so easily...). However, Nagisa loves it--she not only gets the chance to sleep all day during class and have the opportunity to vent her frustrations on the local bullies (did I mention she's the heir of a martial arts dojo? 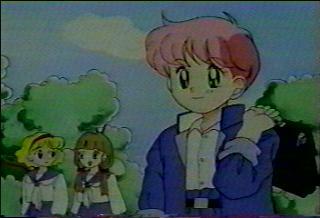 ), but she also gets to meet the guy of her dreams--the school's rival gang leader, Nousata Akira. Of course, since Nagisa is masquerading as a boy, Nousata is not all that impressed with another guy drooling over him, but he eventually finds out her true identity (I won't tell you how--it'll ruin the surprise! ^_-). 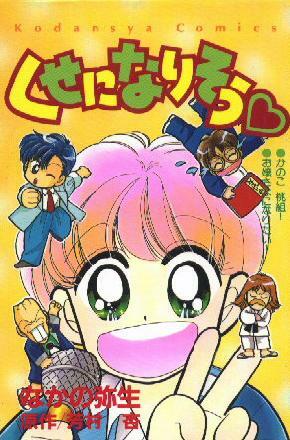 Chou Kuseninarisou! boasts a wide array of zany characters, loads of puns, and the mockery of a lot of pop culture ideals. The best example of how CK parodies real life in Japan is Nagisa herself--the girl, who is a great idol--CAN'T SING! Of course, this may be only my opinion, but essentially Nagisa is backed by an awful lot of promotion with not as much talent as she really should have. If this sounds interesting, please check out the episode summaries I have for Chou Kuseninarisou! And if you want more information on the series, I encourage you to check out CHOU Kuseninarisou!, which is far more comprehensive than mine. The maintainer of that page is also the one responsible for bringing CK to Tomodachi in the first place and is also the generous soul who let me use the images of CK which appear on this page (I'd also like to thank his friend in Japan for the manga scan which appears on the bottom left). If you have any comments or questions about this webpage or Chou Kuseninarisou!, please email me. 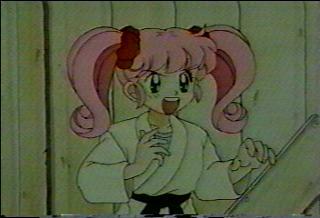 Nagisa has used her "Special Thunder" attack on people.